If you are looking for a way to glam up your next camping trip then I have the product for you. This simple genius of a product will be one that you take with you for all your adult camping trips. Why do I say adult? 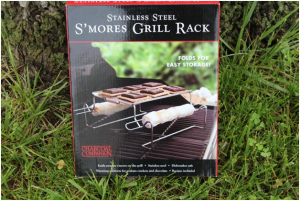 Well, the reason is the fact that if you are an avid camper, you have earned the right to cook your s’mores the easiest way possible and this product will do it for you. What makes this product so unique and handy is the fact that it makes preparing a s’more as easy as one, two, and three. First, it comes with metal rods that slide onto the side of the grill rack. This allows you to cook several marshmallows at once. Yes, I know that takes part of the fun out of preparing this dish but believe it or not there are people that do not like to stand over the fire to roast their marshmallows. The second ingenious task that this simple grilling rack does is one that has always been a problem with s’mores. Let me explain what I am talking about. Picture this; you have roasted your marshmallow to perfection. Prior to putting your marshmallow on the stick, you prepared your graham cracker with a piece of chocolate. Now that your marshmallow is ready, you are prepared to put it on the graham cracker. Oh, I know your mouth is watering now but just wait. You pull your melted marshmallow onto the chocolate topped graham cracker with another graham cracker. Ok, now you are ready to eat. Well, you bite into the dessert, the graham crackers crack, the chocolate is not melted, and your marshmallow is oozing out the back and sides of the graham crackers. But this will happen no more with this new product. While I was testing this new s’more cooker, I found that putting it over prepared charcoal allowed the marshmallows to gently tan and the chocolate on top of the graham cracker slowly melted. Neither one of these events caused oozing out of the ingredients. The roasting and melting was gentle. Once the ingredients were cooked to perfection, I assembled the dessert and enjoyed. While I do like my marshmallows cooked more, I found that the melting of the chocolate allowed the dessert to stay together. Overall, I really enjoyed trying this new product. It was easy to use and made s’mores somewhat easier to eat. It would be great if you were having a glam camping trip with wine since you could cook several up at a time. Another positive about this product is it allows even the smallest camper the ability to build their s’more without having to be near the fire. The only negative I have found with this product is the fact that it really is not designed to be used over a flame but if you let the fire burn down, I found that it works perfectly fine. The price, functionality, and compact size make the s’more grill rack a camping item I will always pack for my camping trips.